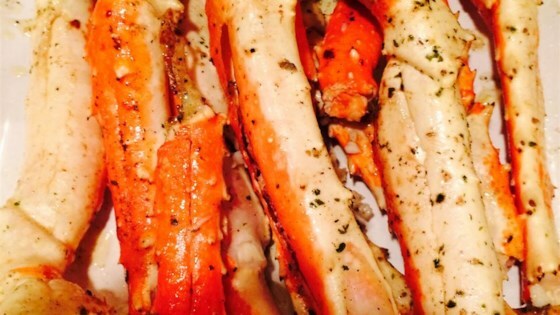 "I ended up getting some snow crab legs on sale at the market. I wanted something a little different from plain steamed, boiled, or grilled crab legs, so I ended up throwing a few things together to make this awesome crab leg dish. Enjoy! This would be great with shrimp as well." Cut a slit, length-wise, into the shell of each piece of crab. Melt the butter in a large skillet over medium heat; cook the garlic in the butter until translucent; stir in the parsley, salt, and pepper. Continue to heat mixture until bubbling. Add the crab legs; toss to coat; allow to simmer in the butter mixture until completely heated, 5 to 6 minutes. Decadent crab legs dripping in garlic butter sauce! My favorite recipe ever! Split the shells before you throw the crab legs in. Once done remove the legs and pour the butter sauce into a dish for dipping....mmmmm good. Recipe stands out but I did add this time cayenne and old bay! Great! My husband and I loved this and can't wait to try it again.